The understanding, study, and use of educational tools and their application to the education of adults in professional fields are increasingly important. In this review, we have compiled a description of educational tools on the basis of the teaching and learning setting: the classroom, simulation center, hospital or clinic, and independent learning space. When available, examples of tools used in nephrology are provided. We emphasize that time should be taken to consider the goals of the educational activity and the type of learners and use the most appropriate tools needed to meet the goals. Constant reassessment of tools is important to discover innovation and reforms that improve teaching and learning. Educational tools, especially those related to technology, are populating the market faster than ever before (1,2). The transition to active learning approaches, with the learner more engaged in the process rather than passively taking in information, necessitates a variety of tools to help ensure success. As with most educational initiatives, time should be taken to consider the goals of the activity, the type of learners, and the tools needed to meet the goals. Constant reassessment of tools is important to discover innovation and reforms that improve teaching and learning (3). Available resources and tools range from technology-driven solutions to strategies for creating more interactive and engaging learning opportunities. With the digital divide diminishing and a new era of technical literacy well under way, learners can be brought together in new and exciting ways (4). Many new tools focus on learning outside the confines of a traditional classroom, making them excellent resources for adult learners in professional settings (5). Increasingly, we find that technology-based solutions for learning allow individuals to determine their own educational path and achievement of competencies through innovative new platforms (6). Discussion boards, blogs, interactive exercises, simulations, visualization software, and multimedia software all encourage learners to manage their own learning. Richard Mayer (7) developed the cognitive theory of multimedia learning in part to help us better understand how people learn from both words and pictures. Mayer (7) suggests that there are many factors involved in appropriate multimedia instruction and that there are three primary instructional goals in any learning environment that need to be addressed regardless of the type of teaching: (1) extraneous processing by the learner must be minimized, (2) essential processing by the learner needs to be managed appropriately, and (3) generative processing or meaningful learning is critical to all learning situations. Mayer (8) challenges us to think critically about multimedia instruction and its appropriate and effective use. His work (8,9) calls out the need to consider how people learn in simulated environments and with multimedia and how that translates to application of the activity (9). These guiding principles are critical as new tools are developed, used, and assessed. Technology should not be used in a vacuum of research and applied education theory and understanding. Using the guidelines above gives a way to think about the tools in this article and determine if they are helpful and the right ones for the learning environment that you want to establish. In this article, we have compiled a short list of tools that can keep you thinking outside the box. The tools are organized on the basis of the setting where the teaching and learning take place, including classroom, simulation center, hospital and clinic, and independent learning. This provides both a framework for discussion and a roadmap (Figure 1) for where to use the tools, with the caveat that many of them crossover from one setting to the next. Roadmap of educational tools available in the different settings where medical education takes place. 3-D, three dimensional. The classroom remains a common setting for medical education but one that is being transformed by new techniques and tools. Active learning is a model of instruction in which students engage with materials through a variety of methods, including reading, talking and listening, writing, problem solving, and reflecting (10). The responsibility of learning is focused on the students as opposed to the traditional passive lecture format. The flipped classroom is one large–group active learning technique and discussed below. Another form of active learning is problem-based learning (PBL), which will not be discussed, but the reader is referred to several excellent reviews (11,12). PBL focuses on applying material in context and integrates both basic science and clinical knowledge for solving complex problem sets. In PBL, a multipart clinical case is presented to a small group of students, who then work through the case using critical thinking applied knowledge skills. In this process, faculty act as facilitators (tutors) to support and guide the process. Flipped classroom is the popular name for a variety of pedagogies that flip the traditional roles of the class lecture and homework outside the class. In this technique, rote information is learned before class through a series of miniature lectures, and the class time is used for interactive learning (13). More than any other recent disruption, the flipped classroom has the power to turn learning experiences into higher–order thinking skills exercises, resulting in more critical thinking and richer, deeper learning experiences. When the classroom is flipped, students are forced to take greater ownership by learning the material and then coming to the session ready to apply and evaluate what they know. There is no right or wrong way to flip, and there are many models available to fashion a flipped experience (14). Preliminary research indicates that attendance, learning, and perceived value of the education all increase with the flipped model (15–18). The use of instructional videos to create replicable content delivery is a method that more and more educational settings are relying on for consistency, validity, efficiency, and cost effectiveness. Traditional video streaming and capture of long face-to-face lectures have shown relatively little retention and satisfaction for learners (19). However, the use of the new shortened topic–specific models have proven much more positive. The Khan Academy has produced an extensive series of high–quality short scripted video tutorials around medical topics that presents the information for students to learn, think about, and ultimately, apply in interactive scenarios (16,20,21). This is a disruptive innovation that early on allowed for nonclassroom intensive learning experiences driven by the student. Audience response systems (ARSs) are tools to facilitate active learning that can increase audience participation in the classroom and assess learning in real time (22,23). ARSs allow the teacher to gauge where the learners are as a whole, what areas they may be struggling with, and in turn, what issues need to be addressed immediately. This is especially useful when there are a variety of learners in the classroom and there is a need to have learners on the same page to discuss larger or more in–depth areas of content. Boscardin and Penuel (24) performed a review of the literature examining the efficacy of ARSs and concluded that ARSs increase learner engagement but do not uniformly improve learning, although there were confounding factors that made interpretation of some of the articles difficult. Other studies have shown improved learning and knowledge retention with use of ARSs (25,26). The technology behind ARSs has advanced significantly, with older hardware–based devices, such as classroom clickers, being replaced by software/Cloud–based audience response using mobile phones, Twitter, or web browsers (for example, www.polleverywhere.com). Other programs, such as TodaysMeet (www.todaysmeet.com), provide a backchannel chat platform for teachers and learners that can be displayed in real time during the presentation to allow multilocated learners to comment or ask questions. This tool expands the classroom community and empowers learners to be more interactive. Virtual classrooms are platforms that allow students to receive instruction from a qualified teacher in an interactive environment using a variety of communication technologies. Software, such as WebEx, GoToMeeting, GoToTraining, or Adobe Connect, can all enable virtual classrooms. These tools allow communication through webcams, microphones, and real-time chat. Virtual classrooms allow participants to see instructional material, raise their hands to comment and ask questions, and take polls and quizzes from anywhere in the world. Learners can also screencast and add to whiteboard presentations. Software, such as Voicethread (www.voicethread.com) and Zaption (www.zaption.com), facilitates interactions in a virtual classroom setting. Voicethread is an interactive presentation software that allows the user to upload different types of media (video, PDFs, and pictures) into a single presentation format, and then, voice threads are created (asynchronously) on the presentation (27). Learners can be involved in a dialogue among themselves, with the faculty, and/or with a combination of the two. The power in this model is the ability to create cohorts of learners who interact on common questions, case scenarios, and content in an asynchronous environment. With Zaption, content is presented with a video, and then, the teacher can drop in ways to engage with the content, turning a passive watching activity into an active learning activity. Learners not only watch the video but also, are directed to engage in a variety of real–time active problem–solving and reflection activities that correspond with the content. Zaption can be used on computers and mobile devices as well, making it an interesting partner to the flipped classroom. This gives a home for content to live before the discussions and forces learners to engage and reflect on the content and be prepared to discuss it in an applied manner. Digital badges are a recent concept designed to recognize and validate additional training or activities beyond the usual educational accomplishments and may be used to manage content criteria and assessment (28). Digital badges are an electronic certification of accomplishment and in concept, similar to physical badges used by organizations, such as the Boy Scouts of America and the military. They are digital tokens that appear as an icon or logo, and they are stored electronically in a badge repository, such as Mozilla–hosted Badge Backpack (http://openbadges.org), Credly (www.credly.com), or BadgeOS (www.badgeos.org). Metadata are contained in the different layers of the badge, including badge name, issuer’s and recipient’s information, criteria for the badge, description of the badge, issue date, expiration date, and a link to evidence supporting granting of the badge (Figure 2). Digital badges can be accessible from the recipient’s curriculum vitae, Dean’s letter, ePortfolio, or signature line and can be placed on social media sites, such as Facebook, Google+, and LinkedIn. Anatomy of a digital badge. Schematic representation of a digital badge consisting of a badge image and various metadata about the learner’s accomplishment. Reprinted from classhack.com, with permission. When used to their full capacity, digital badges are a means to help learners self-identify areas of strength and improvement, provide feedback on specific knowledge, skills, and attitudes, and track progress toward competence and mastery. Because the learners are responsible for collecting and presenting evidence of their progress, this tool may be useful for developing skills in lifelong learning and mastery of information. For adult learners in particular, being the owner of the learning can be very motivating and may even improve learning outcomes. Digital badges are being used by the Khan Academy and in higher education (29). Boston University School of Medicine has a medical education badge program (BUSM+) to learn the fundamentals of teaching and learning (30). Simulation–based medical education (SBME) is a common method to teach technical and nontechnical skills and test competencies (Figure 3). This method is based on the premise that making and learning from mistakes are powerful ways to learn. SBME takes multiple forms and can be performed by individuals and teams (31,32). A number of tools exists for SBME. Mannequins are lifelike full or partial body models used for a variety of simulation exercises. Partial task trainers are anatomic models that resemble a portion of the body and are used to practice one specific skill. Virtual reality simulators, such as LapSim, are used for practicing laparoscopic procedural skills. SBME can also involve use of virtual patients and virtual hospitals or can occur in situ, a setting that is especially conducive to interprofessional team training (33). Advances in technology allow realistic and even patient–specific three–dimensional models to be constructed and used to create interactive virtual models for teaching anatomy and learning procedures, such as kidney biopsy (Figure 4). Simulation-based learning. 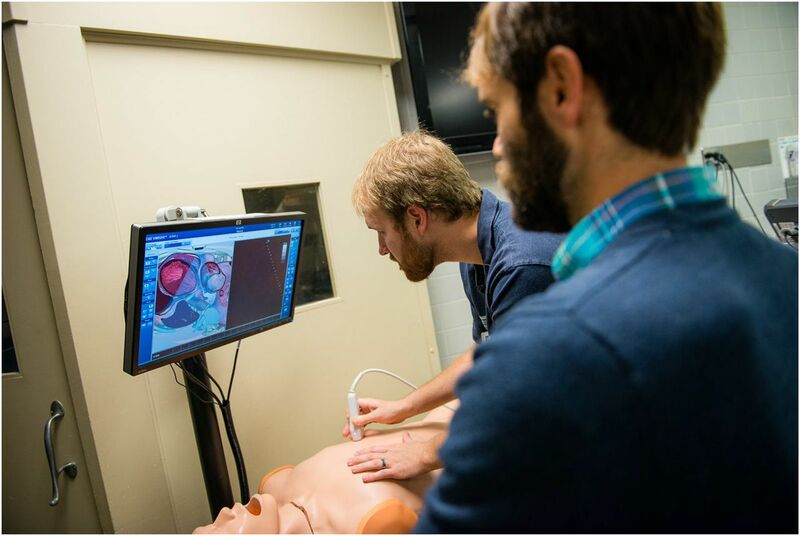 A trainee performing echocardiography on a mannequin in a simulated environment and being observed by a faculty member. Reprinted from SimPORTAL, University of Minnesota and Spicy-Meatball Photography (Joe Vruno). Model of kidney anatomy for simulation. This is an example of a three-dimensional model of kidney anatomy that can be constructed and used to create interactive virtual models for teaching anatomy and learning procedures, such as kidney biopsy. Patient-specific models can be created using Digital Imaging and Communications in Medicine standards, which can then be converted into meshes and subsequently, three-dimensionally printed. Reprinted from Daniel Burke and Dr. Robert Sweet, SimPORTAL, University of Minnesota. In 2010, McGaghie et al. (34) performed a critical review of SBME research and concluded that the work in SBME was promising but just beginning and that it required additional research and review. McGaghie et al. (34) cited 12 critical traits of SBME that still guide the ideas behind good simulation tools today, ranging from simulation as a feedback source to thinking about context in learning. Since that time, a considerable amount of work has begun to show up on the importance and efficacy of simulation-based models of education. Additional research in specialties, including nephrology, shows that, although initial training on simulators may show improved skills or capability in the learning, over time, there is a fairly significant decline, indicating that perhaps the strength of simulation is in ongoing training and practice, where all levels of learners return periodically to test and improve themselves (35). Okuda et al. (36) summed it up nicely by concluding that most medical students, residents, and fellows will now do a fairly significant amount of training on simulators but relatively little data exist on the ultimate outcome of this work on patient outcomes. Active learning through games for education and training are referred to as serious games to contrast them with more conventional video games (37–39). Serious games can be used in both the simulation center and for independent learning, and they tend to be more learner-centered, interactive, and engaging than traditional teaching models. Serious games vary in complexity and technology requirements and in medical education, are often used to teach technical skills, team work (often with an ultimate goal of improving quality and patient safety), and complex decision making and excite students about a medical topic (38,39). The development of games for medical education should define a clear goal for learner outcome, the rules for playing the game, and a method for players to track their progress toward the goal. Games should focus on the learning objectives and not on the technology. A consensus-based framework for the assessment of medical serious games was developed that provides 62 items in five main themes (game description, rationale, functionality, validity, and data protection) (37). The effectiveness of gaming as a learning tool needs additional study (40–42). Graafland et al. (38) did a systematic review of serious games for medical education and surgical skills training and identified 25 articles describing 30 serious games. Of the games identified, none had a full validation process performed. In nephrology, a game-based format has been used to teach management of transplant patients (43), phase-contrast microscopy of urine (44), and important concepts in nephrology (45). A resource for those interested in more information is the Journal of Medical Internet Research Serious Games (www.jmir.org), which is devoted to computer/web applications that incorporate elements of gaming to solve serious medical and health problems. Much of medical education takes place in hospitals and clinics, in hallways or workrooms of hospital wards, at the patient’s bedside, in the operating room, or in an outpatient clinic room. Tools are available to facilitate and enhance the learning experiences in these settings. Many resources are available for the learner or provider to access answers to clinical questions at the point of care. The widespread availability and use of mobile devices, including smartphones and tablets, enable the use of point of care resources (46). UpToDate, originally developed by Burton Rose in 1991, was one of the first and most used online resources designed to provide evidence–based decision support at the point of care (www.uptodate.com). The initial focus of UpToDate was nephrology, but it has now expanded to 22 clinical specialties, is used by health care providers all over the world, and can be accessed by both computer and mobile devices. An association between use of UpToDate and improved patient outcomes has been reported (47). Medically related applications are widely available and can be downloaded onto smart phones, iPads, and other devices. Many of these can be used as learning tools and readily available sources of point of care information. Applications can provide differential diagnosis, treatment algorithms, drug-dosing information, antibiotic choices, and medical calculators. Nephrology applications are available, including Nephrology On-Demand Plus and Nephrology Tool by Epocrates. Standards and a framework have been proposed for assessing digital health applications but are currently not widely adapted (48,49). Teaching on the hospital ward or clinic is a way to increase learner engagement and excitement around clinically relevant topics. iPads can be used as a way of modernizing these clinical chalk talks. Applications are available to turn iPads into digital whiteboards for on the spot teaching and collaboration (50). For example, on BaiBoard (Lightplaces Limited; free), a cloud–based collaborative whiteboard application (currently available on iPads and Mac), a hallway presentation can be done from either a blank iPad screen (canvas) or one preloaded with graphics, pictures, PDFs, or movies. Graphics, text, drawing, PDFs, or images can be added during the presentation using a wide range of tools, including importing from Dropbox, Google Drive, or the web. The presentation can be shared on other participants’ screens or sent to a classroom screen and may include offsite individuals who can connect with an IP address to the meeting in a secure manner. Many other whiteboard applications are also available (Table 1). Google Glass is a wearable computer consisting of a camera, processor, and small computer screen mounted to the edge of eyeglass frames that can search the internet, take photos, record video and audio, and thereby, provide a first person point of view (51,52). For medical education, Google Glass has been used as a tool to facilitate the teaching of surgical techniques, for recording simulated patient encounters, and for teaching anatomy (53,54). Although no longer available through the official Google Play Store, there are rumors that it may arise again as an enterprise and not a consumer product. Work is ongoing in the use of newer technology for imaging procedures with the goal of improving surgical training. Surgeons have recorded operations using Oculus Rift, a virtual reality headset to provide a fully immersive three–dimensional experience (55). The potential application of wearable technology in health care and medical education remains intriguing. Independent learning remains a lifelong skill required of all physicians. With the explosion of medical knowledge and resources for learning, it is important for health professionals to develop their own strategies for keeping up to date with the latest development in basic and clinical science. This section will summarize a number of tools available for independent learning. An e-textbook is best described as a digital version of a physical textbook often used for a specific course at an educational institution. e-Textbooks are downloadable to laptop, tablet, or smartphone and include searching capability, personal highlighting, annotation, linking, and possible inclusion of audio/video or interactive media. An example of a new e-textbook in nephrology is the recently published Chronic Renal Disease, which is available in both print and as an e-textbook (56). The book has a companion website with downloadable figures either as PDFs or PowerPoint slides along with an interactive test bank (57). The general term e-learning is most often used to describe learning conducted through electronic media, most commonly outside of the classroom and delivered online using the Internet. e-Learning can be synchronous, occurring in real time with all learners participating and interacting at the same time, or asynchronous, with individual learners proceeding at their own pace. Social media is the term used to describe online resources that can be used for information access and exchange and collaboration. Social media are increasingly being used for e-learning and may be better suited to keep up with the rapid pace of new knowledge generation and dissemination and the hunger for anytime, anywhere learning. A unique feature of social media is that it provides opportunities for rapid interaction among a community of users. Tools commonly used for social media include websites and applications dedicated to forum or discussion boards (e.g., Usenet), blogging (e.g., WordPress, TypePad, and Blogger), microblogging (e.g., Twitter), social networking (e.g., Facebook, LinkedIn, Doximity, and Google+), social bookmarking (e.g., Flickr), social curation (e.g., Reddit and Pinterest), and wikis (e.g., Wikipedia). Twitter is a microblogging platform widely used across medical education. Users can receive and send short (140 characters) messages called tweets. Twitter also provides opportunities for chats that are real–time synchronous learning opportunities to share ideas and communicate about specific topics, often with a facilitator moderating the discussion (e.g., Twitter journal clubs). The term free open access meducation (medical education; FOAM; #FOAMed is the Twitter hash tag) has been used to describe the use of social media characterized by a crowd-sourced collection of online content that can be in multiple formats, including blogs, podcasts, tweets, Google hangouts, discussions, videos, text documents, photographs, Facebook groups, and other content (58). FOAM has been most fully adapted by emergency medicine and critical care. The content is meant to be constantly evolving, collaborative, interactive, and personalized to meet the requirements of the individual user. Content can be easily accessed from any device that can connect to the Internet (59). Use of social media in medical education has been associated with improved knowledge, attitudes, and skills, but there are very few randomized controlled trials (59). A number of barriers and challenges to the use of social media includes technical issues, variable learner participation, distracted state of users, and privacy concerns (59). Other issues include the randomness of discussions, the quality of material, and the absence of peer review before information is posted. Generational differences and the degree of embracement of social media often exist between learners and educators (noting that generational differences more likely contribute to this than educational expertise). Kind et al. (60) have provided some useful tips for the use of social media by medical educators. There are various websites that compile nephrology educational material (Table 2). These often contain lectures by experts in the field, images, videos, links to clinical practice guidelines, news reporting, a place for sharing ideas and networking, and a repository for tools that can be useful for both nephrology education and clinical practice. Not all emerging tools and educational innovations will be successfully adopted (61). 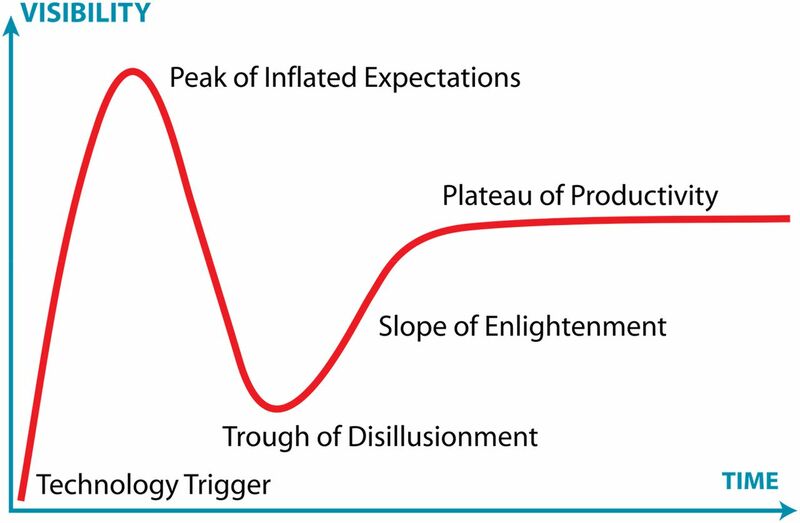 The hype cycle provides a framework for thinking about the life of certain innovations. It is an analytical model developed by the information technology research and advisory firm Gartner Incorporated (www.gartner.com) (Figure 5) to conceptualize where the emerging technology is in the developmental continuum. It describes five phases representing the development, adoption, and spread of specific technologies. The hype cycle. Hype cycle analytical model developed by the information technology research and advisory firm Gartner Incorporated. The five key phases of a technology’s lifecycle are illustrated. The concept has been applied to emerging technology in education (details in the text), from Jeremykemp at English Wikipedia. This model has been applied to education with the Hype Cycle for Education tool developed at the University of Minnesota. This is community-sourced information about technology in higher education (62). The tool allows users to learn and monitor new academic technologies, share experiences with these technologies, and innovate by adopting new technologies or applying new techniques. The ultimate goal is to improve strategic decision making regarding financial and time investments in technology. The understanding, study, and use of educational tools, their place in the hype cycle, and their application to education of adults in professional fields are increasingly important. With a millennial generation (born 1985–2000) who are more technologically literate than any previous generation, are more attuned to the need for active learning, and have more experience in collaborative work environments, we are being forced to reassess not only what we teach but how we provide the information. Having a solid understanding of the landscape of educational technology is equally important as understanding and use of any specific tools. With a market that is continuously creating new and improved tools, keeping a focus on the tools’ intended use is imperative. Of the many tools described in this review, some are more likely than others to survive the hype cycle and become a part of the educators’ toolbox, whereas others are likely to be replaced by other educational innovations. It is difficult to predict which tools will stay and which will go, but many are already showing signs that they are not just passing fads. Active learning is becoming firmly established, even to the point of medical schools designing and building classrooms suitable for this form of pedagogy. This will involve greater use of the flipped and virtual classrooms, including the use of short videos and ARSs. Simulation and the technology and tools related to it are also becoming established, especially with greater health system focus on quality improvement and patient safety. There will also continue to be expansion in the use of social media to facilitate communication between learners and educators and as a way to stay updated on the latest developments. The hype cycle exists on several levels: within departments, within schools, within institutions, and within the larger world of education as a whole. Each of these spheres influences the innovations that will stay and to what degree they will be imbedded in the culture of medical education. Those that show sustained staying power tend to permeate more of the spheres of influence, tend to generate a need for deeper understanding that leads to further scholarship and research, and are applicable in multiple settings. Adult learners will continue to expect new tools with which to learn, and they will also be some of the creators, improvers, and in some cases, rejecters. Both faculty and learners must have some capacity to try new tools and teaching techniques. This requires a culture of permission to try and not always succeed with technology, time to work with the technology, and understanding of what technology fits best within the pedagogy and discipline, and it also requires financial capital and occasionally, space to store and work with the technology. In a review such as this, there are many excellent tools, social media sites, and other resources that have inadvertently been left out or that have been developed during the writing and publishing of the article. We suggest using #mededtool on Twitter to share your favorite tool, comment on exclusions, or discuss new tools. Hashtag (#) is a way to categorize messages and is useful to mark a topic in a tweet that can then be searched. There is no single solution in moving forward with innovative teaching and learning techniques. Technology comes and goes, learners come in all types as do faculty, and time and money are almost always at odds with the day to day operations. However, taking a step and trying out even one new technique, technology, or training experience can create a huge step in a new direction to improving patient care even more dramatically over the next decade. M.E.R. is the coeditor of the textbook Chronic Renal Disease that is discussed in the article. The content is the responsibility of the authors and does not reflect or represent the views of the American Society of Nephrology, for which M.E.R. serves as a councilor.